The stuffed animal's eye can detach, posing a choking hazard to young children. No injuries have been reported. The recall includes 25,000 Sulley character stuffed animals in the U.S. Sulley is a furry blue creature from the Monsters movies. 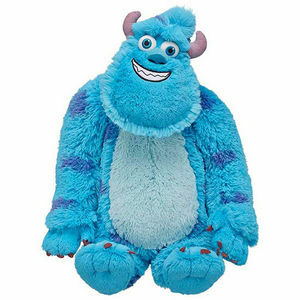 The Build-A-Bear stuffed monster is covered in blue furry fabric with purple spots, horn on its head and has blue eyes measuring about 1 inch in diameter. The stuffed monster is about 17 inches high and 10.5 inches wide. Tracking label ending with 4384 or 4385 for USA and 4378 for Canada can be found on a sewn in label on the backside of the leg of the stuffed monster. Build-A-Bear Workshop stores and online at buildabear.com during June 2013 for about $23. Immediately take the recalled Sulley from children and return it to any Build-A-Bear Workshop store to receive a coupon for any stuffed animal from Build-A-Bear Workshop. For more information, contact the company by phone at (866) 236-5683, by email at ProductHotline@buildabear.com or go to buildabear.com and click on Product Recalls at the bottom of the page. Build-A-Bear toll-free at (866) 236-5683 between 8 a.m. and 8 p.m. CT Monday through Friday, on Saturday between 9 a.m. and 6 p.m. CT and on Sunday between 10 a.m. and 7 p.m. CT. You may also email the firm at ProductHotline@buildabear.com. Visit the firm’s website www.buildabear.com and click on Product Recalls at the bottom of the page for more information.